The days are getting shorter as autumn approaches, and volunteers around the country are getting their bug nets in order, preparing for the brief season when monarch butterflies will be migrating through their communities. Arguably the most recognized butterfly species in the world, monarchs captivate our imaginations with their big, colorful wings and long migrations – the longest of any insect. 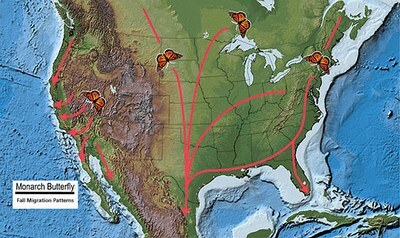 Most monarch populations east of the Rockies fly to central Mexico, while the Western populations generally fly to several groves along the California coast. The Rocky Mountains divide the eastern and western monarch butterflies. Most eastern monarchs migrate to Mexico in the fall, while most western monarchs spend the winter in California. Both monarch populations are in trouble, though. The Mexican government reported last March that the overwintering population in Mexico has experienced a dramatic decline. Scientists have speculated that this decline is due in part to loss of milkweed, which is the sole food source for monarch caterpillars, in the Midwestern corn belt as well as deforestation in the monarch’s overwintering sites. Chip Taylor, an entomologist at the University of Kansas, says the reason for declines in the Western populations likewise include habitat loss, but that drought and increased summer heat also create unfavorable conditions for the monarch. To help scientists understand how monarch populations are changing, volunteer butterfly enthusiasts around the country join the Monarch Watch, a University of Kansas education and research program, to tag migrating monarchs. The data that volunteers have collected over the last two decades has helped scientists develop a more nuanced understanding of both Eastern and Western monarch migration patterns, and may help answer some outstanding questions, such as where, exactly, the Western populations migrate from in the fall, and what is causing the decline in numbers. 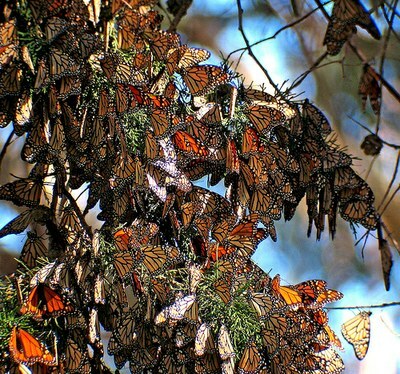 Monarch butterflies gather in clusters to overwinter, like these found at Pismo State Beach in California. Since Monarch Watch started in 1992, volunteers have tagged roughly 1 million monarchs. Of those, about 17,000 have been found later, or “recovered.” That’s just over 1 percent, which Taylor says is a fairly high rate. Those 17,000 recoveries have already helped scientists better understand butterfly migration, but to draw conclusions about trends, they need to gather a lot more data. “Once you get into the millions of recoveries, you have something extremely useful,” says Taylor. Monarch tagging programs in the west are growing through programs like Arizona’s Southwest Monarch Study and The Nature Conservancy’s program in Nevada, and with more volunteers, recovery rates will likely go up as well. The Southwest Monarch Study has already made strides in collecting some important data. Gail Morris, who leads the Southwest Monarch Study with her husband, says that monarchs in Arizona and New Mexico have never been as closely monitored as those in the Midwest. Morris says that 16 or 17 of the monarchs tagged in Arizona have been recovered in Mexico and a few others in California. Some appear to overwinter in Arizona and have been recovered in Phoenix. Taylor says that scientists have suspected that this kind of crossover exists in the Southwest. Though these numbers are small, the recoveries give evidence to support that theory. “What we don’t know is whether they come back up that route and repopulate,” says Taylor. 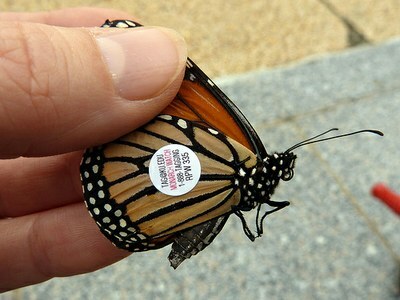 Unique codes on sticky tags help scientists track individual monarch butterflies. Migration season usually begins in late August in southern Canada and progresses southward, arriving in Arizona by late September. As the migration approaches, volunteers with butterfly nets and notebooks in hand go to prime butterfly waypoints: fields with blooming flowers. Flying the length of the continent, or even just a state, takes tremendous energy, and monarchs rely on nectar to refuel. It’s easiest to catch a butterfly when it is preoccupied, sipping nectar from a flower, says Taylor. But like most insects, butterflies are hard to catch. Their eyes are made of thousands of lenses and give them an wide range of vision and sensitivity to movement. Taylor says it’s best to approach slowly, from behind, so you’re out of the butterfly’s sight. A quick flip of the wrist captures the insect in a loose pocket of muslin cloth where the volunteer can gently fold the wings together over the body, remove it from the net, and place a sticky round tag on its hind wing. Each sticker has a unique alphanumeric code, which is entered into the database with the date and location of the tagging. The released butterfly continues on its migration. If another person finds that tagged butterfly at the overwintering site, they can add its location to the database. That information, along with the records of the thousands of other tagged butterflies, can tell researchers about trends and patterns. The disappearance of a much-loved butterfly strikes an emotional chord that few other insects can. Still, since the caterpillars only eat milkweed, and very few animals are willing to eat them as larvae or adults, monarchs aren’t exactly a keystone species. So why, really, does it matter that they are declining? “Monarch butterflies are simply symbolic of things happening in this country,” says Taylor. “We’re losing habitat that they share with other animals, primarily pollinators.” Without pollinators, we lose the fruits, nuts, and other produce that need them. And pollinators, as Taylor says, “keep the system together." Katie Mast is an editorial intern at High Country News. Fall migration map courtesy of the National Park Service. Tagged butterfly image courtesy Katja Schultz via Flickr. Overwintering cluster photo courtesy K. Schneider via Flickr.